Mecca, the Holiest City of Saudi Arabia - Ghumakkar - Inspiring travel experiences. Mecca, correctly known as Makkah, is located 75 km inwards and to the east of Jeddah, the western port city of Saudi Arabia. Its iconic Kaaba was established by Prophet Abraham (Ibrahim A.S.) many centuries before the advent of Islam. Named by Prophet Muhammad (PBUH) as the holiest city of Islam, Makkah existed as a city since over 2500 years; earlier, it was a meeting place for the nomadic warring tribes of the area. Although the tribes fought each other throughout the year, they would meet in Mecca once a year to perform pilgrimage (there was no Islam then, just a pagan form of religion), negotiate trades and generally try and sink their differences with each other. In Mecca, they would converge at the “Kaaba”, then a shrine with statues of pagan Gods. The city and its areas were ruled by the Quraysh tribes, and Prophet Muhammad was born into the same tribe in the year 570 A.D. After the Koran was revealed to him by the angel Jibreel in the Hira cave in the local mountain Jebel al Nour, the Prophet (PBUH) destroyed the pagan idols and “sanctified” the Kaaba, making it synonymous with the “House of Allah”. He also ordained that as per the revelations made by Allah in the Qur^an, a true Muslim was bound to visit Mecca to perform a pilgrimage named as the “Hajj” if he was physically and financially capable of going there. Since then, Mecca has become synonymous with the identity of being the “Holiest place in Islam”. One of the keenest desires expressed by a Muslim is to be able to perform Hajj at least once before they die. 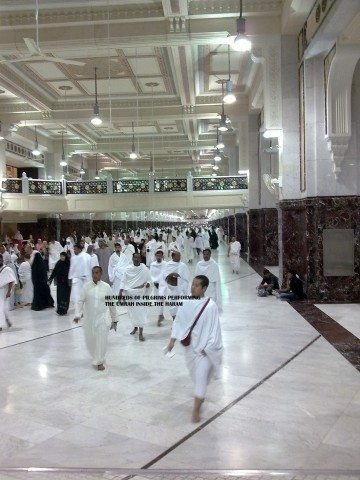 As a “minor” pilgrimage, they perform what is known as an “Umrah”. While the Hajj has to be performed at a specific time of the year (in the twelfth month of the Hijri calendar), and involves a visit to many other locations in and around the Holy Mosque, an Umrah is a simpler, easier and shorter version of the pilgrimage which can be completed in just one day. Furthermore, it can be performed at virtually any time during the year. Those familiar with me already know that I shifted to Saudi Arabia in November 2011, to further my career as a Pediatrician. Although I have been posted more than 300 km from the holy city of Mecca, I have gone there thrice already to perform the Umrah. This, rather touristy account is an attempt to synthesize my experience from all the three visits – one in November last year (2011), one in February and one in April this year (2012), – into a single narration that I hope will enlighten, educate and entertain both Muslim and non-Muslim readers. No account of Mecca can be complete without referring to its being a holy place for Muslims from all over the world. Perhaps the best way to sum up my experience is this: every time I went to Mecca and looked at the Kaaba and prayed before it, I wept with reverence, piety, humility and the utmost sense of being in the House of Allah. (to those who think Allah and God are different names, let me assure you they are not: it’s like someone calling a head cover “dupatta” and someone else calling it “odhni”. It’s just a matter of two different languages, and the entity addressed by the two words is the same as, say, Bhagwan or Parmatma). However, this is not a religious lesson, so let me move on to describe the main mosque at Mecca, which, incidentally, is known as the “Haram Mosque”, or simply, “Haram”. It is the largest mosque in the world, and can accommodate over 4000000 people at the same time while praying the Namaaz (or Salaah, as it is called in Arabic) during the Hajj season. Covering a huge area of 88.3 acres, including the areas within the walls and the huge courtyards without, it surrounds the Kaaba from all the four sides and is considered the single largest place for prayers all over the world. Structurally, it is composed of a huge circumferential building that stretches two storeys above the ground floor. Accessible from all the directions through its ornamentally carved gates (named after previous and present Kings of Saudi Arabia), it is under 24X7X365 maintenance, renovation and surveillance. 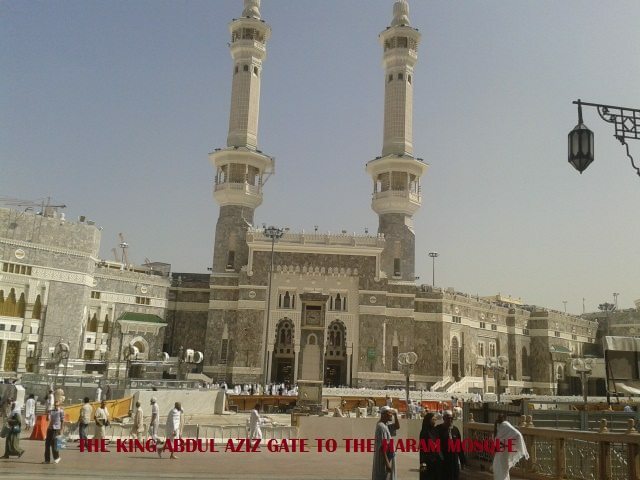 Its gates are open to pilgrims at all times of the day and night, and I have personally performed Umrah at the late hour of from 10:00 p.m. to 02:00 a.m., so as to be able to do so with relatively lesser crowds. While the pilgrims are busy circumnavigating the Kaaba, or performing Salaah, or reading the Qur^an, the mostly Indian, Pakistani and Bangladeshi (but also Indonesian, Filipino and Saudi) staff are busy cleaning, mopping, and vacuuming the entire place round the clock. Their industriousness is truly mind-boggling. Go at any hour, and you will find them moving around with their cleaning machines, wires trailing here and there. At the same time, hundreds of workers are busy at several places inside and outside, laying down fresh marble flooring, digging, filling and renovating the huge grounds. Still others are operating huge cranes, building ever more new structures to create new entrance gates, new corridors, and new sanctuaries for praying. This is not all. A complete crew of staff is only employed to clean, fill and replace the thousands of drinking water containers located all around and inside the mosque. These are filled with water from the thousands of years old wells, the Zamzam well. The water is called Zamzam too, and devotees are seen performing the pre-namaaz ablutions with this holy water, drinking it, and filling large containers with it to take back with them when they return to their respective homelands. There are many other workers here – those who maintain the lavatories, the luggage locker rooms, the electrical fixtures, the scholars who help pilgrims understand the niceties of the religion, the police, the security staff, the voluntary NGOs who look after lost children, welfare of women, charity donations, and so on, and so many more that I cannot even begin to count them. 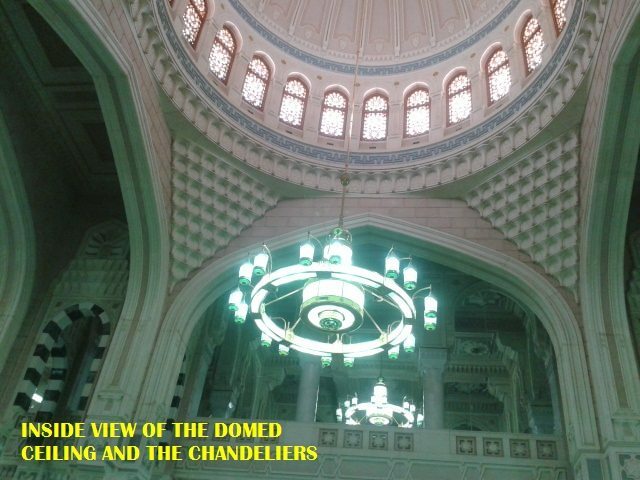 Architecturally, some of the structures of the Haram mosque are simply magnificent. The huge chandeliers, the cavernous halls topped with huge domes, the marble-columns, hundreds upon thousands of them, the beautiful carvings on each of these trying to outdo each other, the sheer grandeur of the place … it is all very humbling when you think about it. The Kaaba itself – what to say about it! 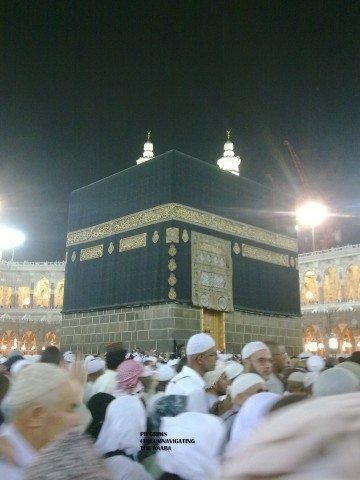 It is almost always being circumnavigated – day and night, Covered with a black cloth that is embroidered with pure gold designs, it stands at the centre of the Haram, marvelous, unique and pronouncing the Glory of the Maker of the Universe. People who go around it (a prescribed 7 times) are seen sending it flying kisses, crying unashamedly, weeping at the wall by laying their heads on it and entreating Allah to listen to their private woes, and generally looking at it with awe and 100% reverence. When I first went to Mecca in November and entered the Haram and saw the Kaaba, I dropped down on my knees and wept. The sight of the Kaaba can really do that, even to someone whose faith is not very strong. 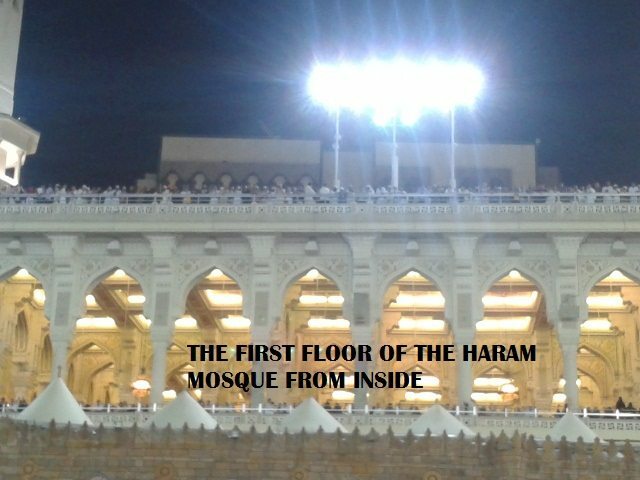 Add to this the sight of hundreds of pilgrims reciting Arabic prayers and walking shoulder to shoulder with you; the fact that each person around you is from a different race, a different country, a different culture – and yet, all are but one before the House of Allah – and it is enough to humble and melt the most uncompromising heart. During each of my three Umrahs, and the several other opportunities I had of circumnavigating the Kaaba on the days following the actual performance of the Umrah, my faith grew and grew. In the real sense. As per the Wahhabi Islam view that the Saudi Arabian government and people adopted, preservation of ancient or heritage structures is a no-no, and every attempt has been made by the Government of Saudi Arabia to erase monuments of the past. Thus, for example, residences of the Prophet, his Companions, his wives or other family members have all been obliterated systemically to make way for promenades, hotels, shopping complexes, and even lavatories. Thus, as soon as you step outside the Haram, you are faced with some of the most modernistic structures in Saudi Arabia. To top the list is the huge hotel that also doubles as the world’s largest Clock-Tower, a part of the Abraj-al-Bait complex, which is also the record holder for being the world’s tallest hotel, the world’s biggest building by floor-space, the world’s largest clock-face, and the world’s second tallest building (see http://www.abrajal-bait.com/ for details and videos). It rises just meters away from the Haram complex, a grandiose structure of seven towers, capped by an astronomical laboratory at the top. The huge clock face with the golden crescentic moon at its apex is truly a structure to behold. Housing as it does one of the largest 5-star hotels of the world with over 1600 rooms, it has, on its ground and the next three storeys, the world’s biggest shopping complexes. 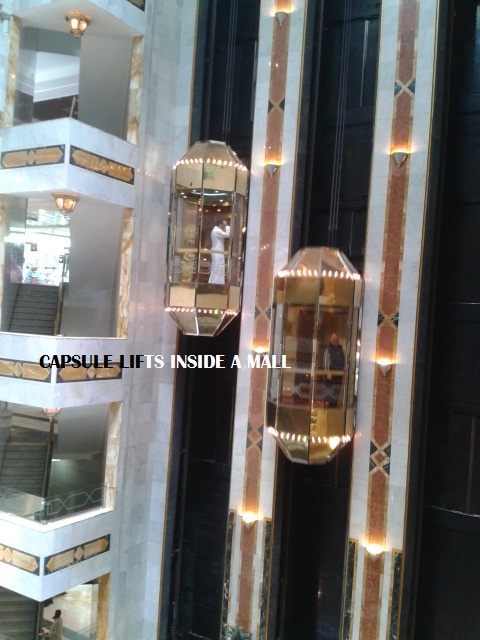 Although I was not fortunate to stay in this hotel, I spent many hours visiting the shopping complex and buying stuff that will rival the best buys in any part of the world, whether the Far East, the European continent or the US of A. There are hundreds of other hotels here, as well as eateries of all kinds, selling Saudi, Turkish, Indian, Pakistani, Yemeni, Lebanese and other kinds of street cuisine. After the last prayers of the evening, the streets around the Haram come alive with hundreds of tourists. They are here to visit the shops that line the roads leading away from the Haram Mosque. The night-life is abuzz with shoppers who come out to merely look at or actually shop for clothes, bags, purses, shoes and slippers, jewellery, toys and utensils, and more. 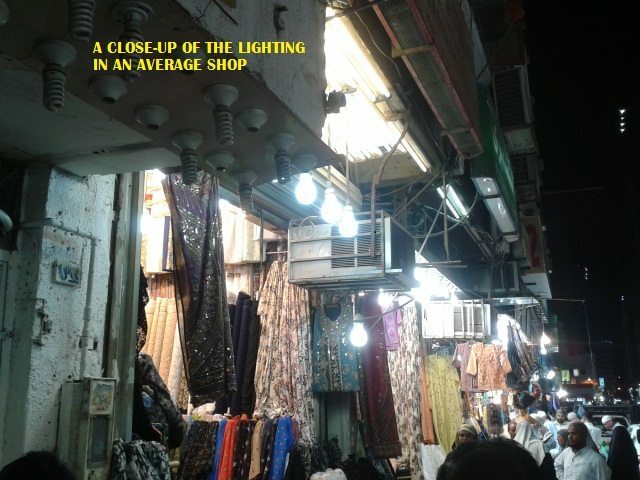 The market is lit up with 200 watt bulbs all over the place, and the unending stream of shoppers makes the roads look much like markets in any large city of the world, my own Mumbai not excluded! Here are some pictures of the revelry seen as evening turns to night. As I already mentioned earlier, Mecca is out of bounds for non-Muslims. In spite of such an injunction, which is, to this day, obeyed unquestioningly by the Saudi authorities, there have been non-Muslim visitors to this city in the past, for example, Guru Nanak himself, the founder of Sikhism, who visited Mecca in December 1518. Down the centuries, Mecca has continually changed to make it more and more welcome to the millions of tourists and pilgrims that throng it every year. No old structures exist, however, as mentioned above. 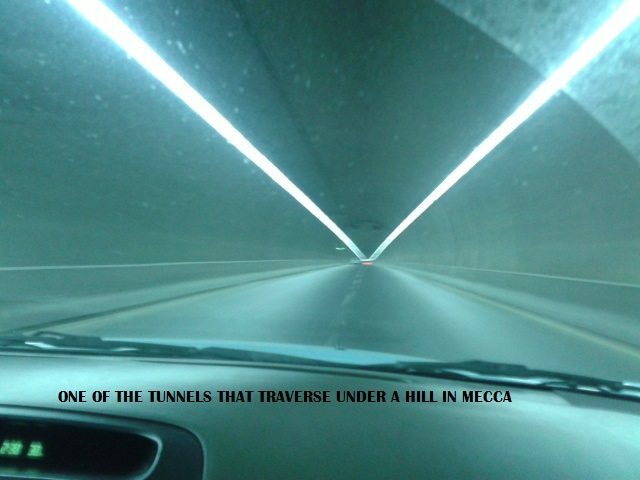 The roads and bridges are modern, and as Mecca is a city within a hilly region, one can see that buildings and structures are made around the hills, and roads tunneled through the hills to allow convenient commuting. 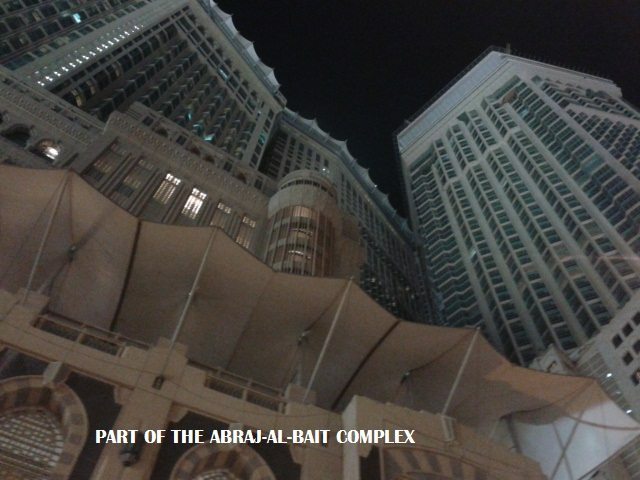 The photographs below are some records of the city outside the Haram area. 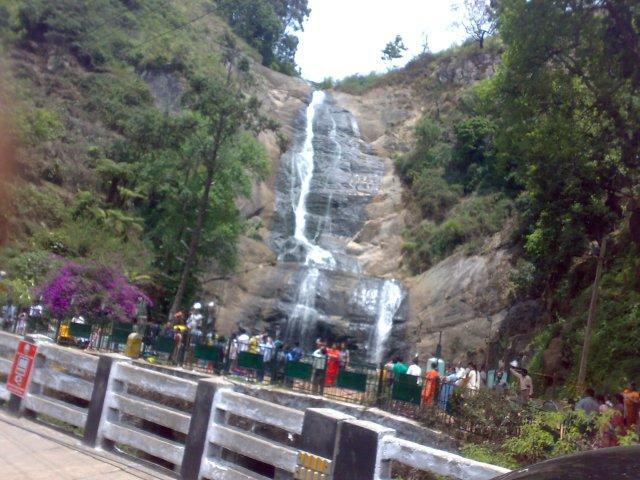 In particular, I wish to draw the attention of the readers to the immaculate and beautiful tunnel road. There are several of these tunnels in the city and they take one from one part of the city to another in a matter of seconds. 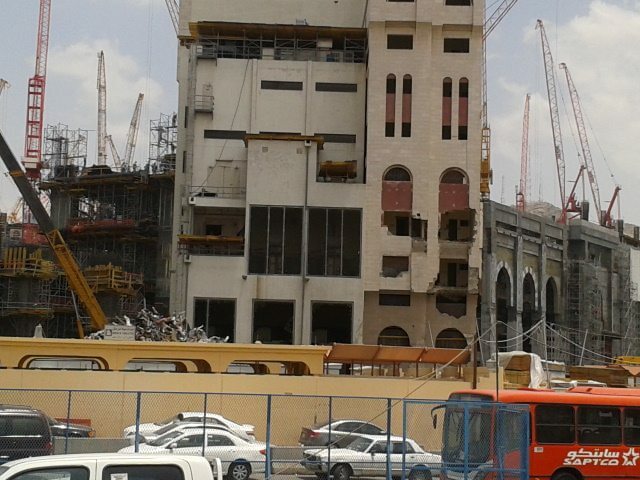 The last picture above shows how frenetic activity is ongoing as a new gate is being added to the haram. The building in the foreground has been vacated, its owners more than adequately compensated, and it is in a state of partial demolition. On the next day, I saw that it had been demolished, and a heap of rubble was the only proof that it had existed until the previous day. Mecca has a very small airport, and pilgrims usually land in Jeddah at the King Abdul Aziz Airport, from where they can proceed to Mecca by road. The distance is 75 km or so. The government bus service runs from all the cities in Saudi Arabia to Mecca all through the day. It is air-conditioned, luxury buses, 2X2, and the service is punctual, clean and efficient. In fact, so convenient is it that one would always prefer to travel by bus (as I did) than go by private taxis. There are no internal public buses or public taxis in Mecca. One can always rent a car through one of the many international car-rental agencies available in the city. Mecca is and will always remain one of the most popular destinations for more than two billion people of the planet. I have attempted to demystify the city and open its heart so that they (the people) may understand a little of its piety and glory even if only by proxy. I am a practising Pediatrician (child specialist) from Mumbai India and have been writing since childhood. I love travelling and Nature-watching. 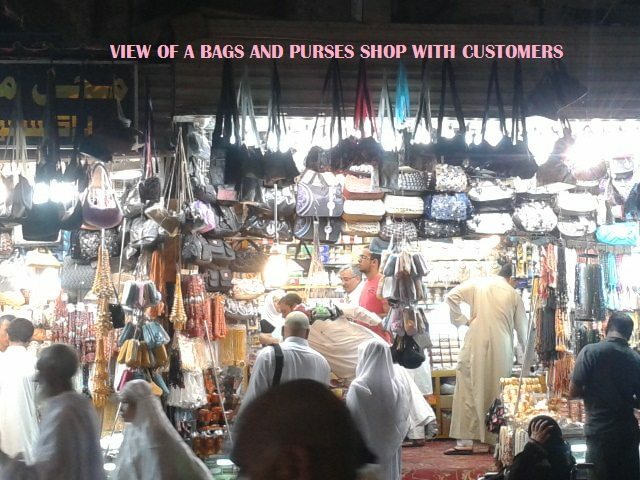 My travels encompass India, Egypt, Saudi Arabia, Malaysia, Singapore and the UK. Your post moved me to tears- just as tears roll down when I sing or listen to bhajans, sufi kalams or when my master’s smile melts my heart- faith has no color, cast or religion. A pious heart, devoid of malice, is what makes anyone ‘faithful’. Beautiful is not enough beautiful to describe your post. And you maintained such a fine balance between worldly matters and HIS kingdom, between emotions and facts, between feelings and observation- just that balance to live the life in this world and yet aspire to be with HIM. Thank you for putting us on a journey to HIM. I agree 100% with your views on the meaning of true faith. Faith can move mountains and certainly make individuals humble and forthright. Thank you so much, Jaishree, for your kind comment. Thanks you Dr. Taher for taking us on a virtual tour of this mysterious place ! Your devotion and beautifully written post has moved me to no end. I am moved no less to read your comment as well as the comments of so many of our readers who are not Muslims, but simply good humans. It takes one to know one. You are one of those priceless members of humanity who can read beyond the bigotry of so-called religious people, world rulers and politicians. I congratulate you and all the others here who have taken out the time and mulled over the article to see the inner beauty of this holy place on earth. The post is surely a must read for people like me who know very little about Mecca. My knowledge till this day had been confined to the association of Mecca to Hajj. That is it! But this post surely gave me more insight to Mecca and surely piqued my interest to know more about it. I am glad my post has acted as a catalyst for you and others like you to know more about Mecca. Perchance, you may also read more about Islam, and if this changes your thinking and makes you more understanding about the true Islam (not the one practiced by the Bin Ladens and other terrorists of this world), I will consider myself a lucky human who has helped demystify this religion. After all, the word “Islam” means “submission” to the will of Allah, and not just carrying on with a distorted “Jehad”. Thank you Doctor for taking us to this Divine trip to the holiest Place . Looking forward to read many more travelogues from you . I will certainly try and live up to your expectations. It is a little difficult to discover places here as the land is quite big … Saudi Arabia has an area almost as big as India, but the cities are far fewer than India, and the population … just a tenth of what India has. Thank you for your kind comment and keep watching this space for more of my writings. Thanks Dr Taher for this enlightening and moving post! It was really an eye-opener and provided great insight into a city I knew very little about. Thank you so much for your kind words and the interest you have shown. Do search for Mecca, Islam and related topics on Wikipedia or Google if you need more information. Believe me, knowledge is never wasted. Few people have the talent to write articles that reflects honesty. As I read through you post I could sense that it directly came from your heart. I enjoyed reading it as much you would have enjoyed writing it! Thank you! Dr Taher for this beautifully written travelogue…I am glad to join Ghumakkar.. Thanks, Dr. Taher, for taking us on a tour of the Holiest Place of Islam, a place which is out of bounds for a non-Muslim like me. As you have mentioned, God is one, doesn’t matter what we call Him or how we worship Him. All barriers are man made, not divinely ordained. A tour of the Makkah Shareef remains one of the greatest pilgrimages on earth and one of the most spiritual and transformational experiences a human can experience. Thanks once again, for giving us this privilege. As you have stated, Saudi Arabia follows are very austere form of Islam known as Wahhabism, which is very intolerant of any form of idolatry and did not spare many of the heritage monuments including mosques built during the Prophet’s time. For Islam, the only holy shrines (Harams) are located in (1) Makkah (2) Madinah and (3) Jerusalem (Al Quds). The rest are just Houses of Worship. Seen in this context, why can’t the Muslims of India be magnanimous towards their Hindu brethren and agree to relocation of mosques built on the sites of demolished temples ? Surely, if the mosques built by the Prophet and his companions (the Sahaba) can make way for hotels and shopping complexes. This would go a long way in promoting communal harmony and brotherhood in India. Thank you for your delightful comments and a most interesting view-point. I am sure the politicians and so-called religious leaders will ignore your POV just as they have been doing for the last donkey’s years. I am no spokesperson of Islam, so I can do little but put this point across to my Muslim friends. However, I know I will not be acknowledged in a positive light. This discussion can be endless … and you are free to meet me on a different forum like Facebook or something to take it further. I thank you once again for enjoying this article. Thank you, Dr. Taher, for your insightful and enlightened response to the views expressed by me. Liberal, intellectual and spiritual individuals like you should write more often and dispel myths and misconceptions about Islam. The way forward is to promote inter-faith dialogue, mutual respect and understanding. 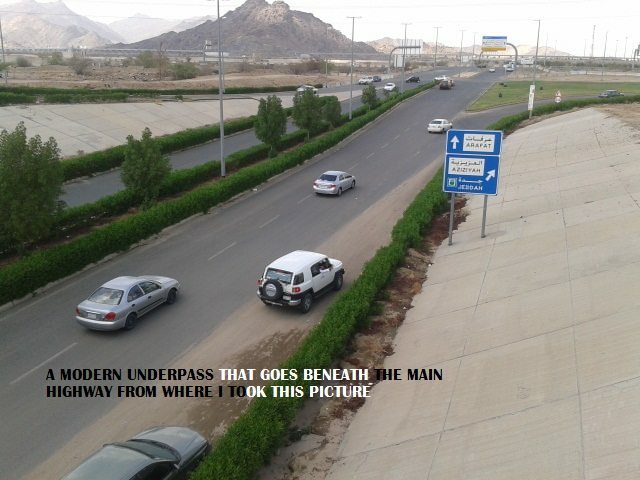 Looking forward to more enlightening posts from you about life in the KSA. Dear Dr. Taher, This is a brilliant post. Moving, heartfelt narration supported by well-placed photographs give us a fair amount of idea of Mecca. I wish that everyone would internalize the message that you are trying to spread in the beginning of the post. Parmatama, God, Allah, Rab are all different names of the same force. And this supreme force is above all classifications. It is only us humans who classify ourselves based on different criteria. We have big egos, not God. Do keep writing and bring us more tales from Saudi Arabia. I thank you and your team for your tireless help in rounding off this write up and making it so interesting to read. It has been well-received indeed and that is very satisfying for me. Be sure to read more from me. 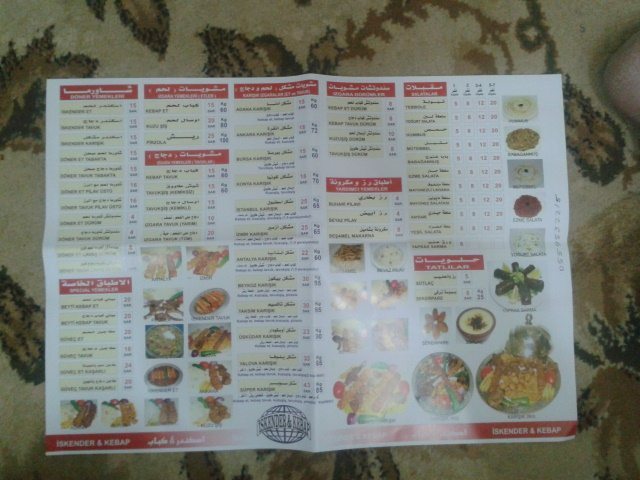 Just a small note on the photos: the hotel menu that you see in the article is of the same place where I took the photograph of the Turkish meal. The soup that you see in the photograph and the roti-bread on the right side were both “gratis”, a sort of welcome to the diner. Only the rice + grilled meat are paid for (and a can of Pepsi that I ordered later). Very interesting post Doc, I like the way you balanced the post, the way you focused on the devotion towards GOD rather than the religion. Thank you providing information about Umrah and Hajj, and for taking us on a tour of Mecca. I read the description of this beautiful place in one of Jean Sasson’s series. First of all I have not enough words to describe your post. I have never seen anybody describing Makkah as you did ever before.This was wonderful . If every person is the world understands this and implements this most of the problems in the world will be solved. Also when you describing your feelings while performing your holy rites , same feelings come to me when I visit hindu holy shrines. Although i am a hindu I would definately love to go there and visit this Almighty’s abode. Also after reading your views you have got a follower ( fan ) in me. I will not do something which is illegal . But you see those were my feelings because for me Lord Shiva and Almighty Allah are one and same . ??? ?? ???? ?? ?? . So abodes are also one and same . Everyone should be allowed . It is only humans who have made differences. In many temples only Hindus are allowed. When almighty is same then why is the difference . That is why I had written in previous comment if everyone understands this many problems in world can be solved. I know that I cannot go there due to rules and regulations , but those were my feelings for the Almighty who is same for everyone . ????? ??? ????? ?? ???? ??? ?????? ???? ?????? ?? ??? ???? ?? ????? ?? ???? ?? ??????? ???? ?? ???? ??? ???? ??????? ???? ???? ??? Bahut bahut dhanyawad. Aapki tippani ne mujhe bahut protsaahit kiya hai, Manish. Excellent post, thought i do regret the destruction of history…. Yes, Ali, you are so right. But, in a way, I see sense in what they are doing. Humans have a tendency to stick to old things and revere them if they can. And their thinking is correct. They do not want people to revere anyOne else except Allah and his Prophet. The information about this great pilgrimage is quite enlightening, especially since I too had very limited knowledge about Mecca. This is a FOG (First on Ghumakkar) and I do not see another story on Mecca coming anytime soon. Many thanks Doctor for enlightening us about Mecca, the holiest of place for Muslims. One of my acquaintances of my father in law has been to Haj and is fondly called ‘Haji Jee’, we meet him once in a while. We also meet our other Muslim friends during Id and have the best of food but I never had a chance to know about Mecca through any of these interactions. My knowledge about Mecca was non-existing. Thank you for taking us there and for your heart-rendering narration. Being a Pediatrician , you get to engage with young pure souls and may be that has further added towards your pure, sacred and blissful account of Mecca. Thank you Doc. Kudos to you for transforming a crude work into a post that has been almost fully appreciated. I am looking forward to visiting other places in Saudi Arabia over the next few years, and be sure that your site is going to get it first from me! 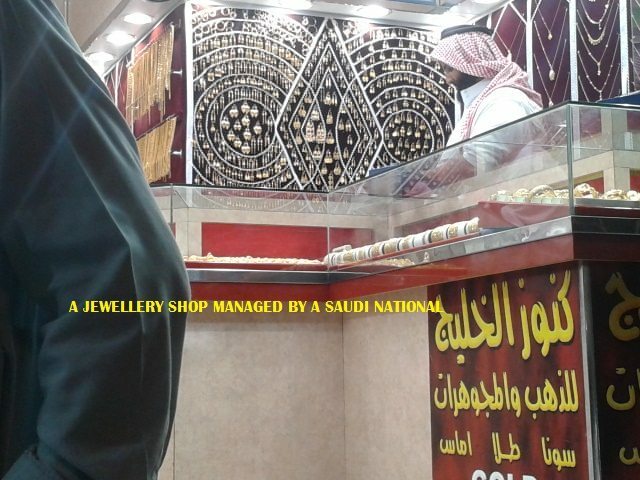 You will be surprised to know that even I knew next to nothing about any of Saudi Arabia before I went there. It is only when we move out of our own comfort zones that we discover the greatness within us. As many have said, this is a heartfelt post. Got to know many things about Holy Mecca through this post. Thanks for sharing. Thank you so much for your kind words. I am glad that you liked my post. ???? ????? ?? ????? ???? ?? ??? ???? ??? ???? ???? ?? ?, ????? ?? ????? ??? ??????? ?? ????? ?? ????? ?? ?????? ?? ???. ????? ??? ???? ???? ?? ?? ???????? ?? ????? ?? ????? ???? ?????? ????? ?? ???? ??? ???? ?? ?????? ?? ?? ?? ???? ?????? ??????? ?? ??????? ?? ???. ?????? ???? ?? ???? ?? ??? ?? ?? ???? ?? ?????? ????? ???? ???? ?? ???? ?? ???? ? ?, ????? ???? ??? ??? ???. Mera vivaran aapko itna pasand aa gayaa ki aapne to meri taarif ke pul bandh diye! Shukriya to main aapka karnaa chahoonga. Aap ko yeh bhi bataana chahoonga ki jitni mithaas aapki likhaai mein hain, us se bhi zyaada aap ki soch mein hai. Yah mujhe bahut achcha lagaa. Phir ek baar dhanyawaad kahta hoon. 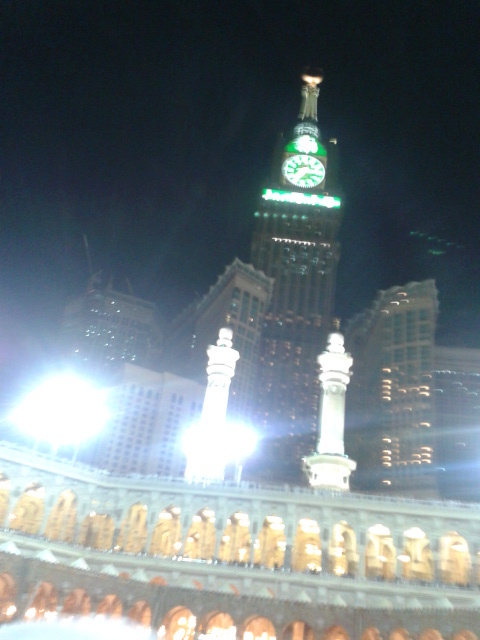 This would be my first time account for Mecca. I have not read much about the same so it was really special for me and i am sure for a lot of our readers. 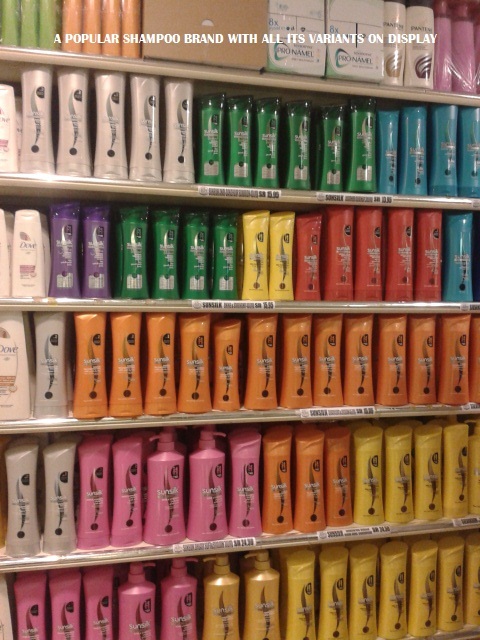 Thanks for sharing the travelogue. Very nice post. I need one permission from you. 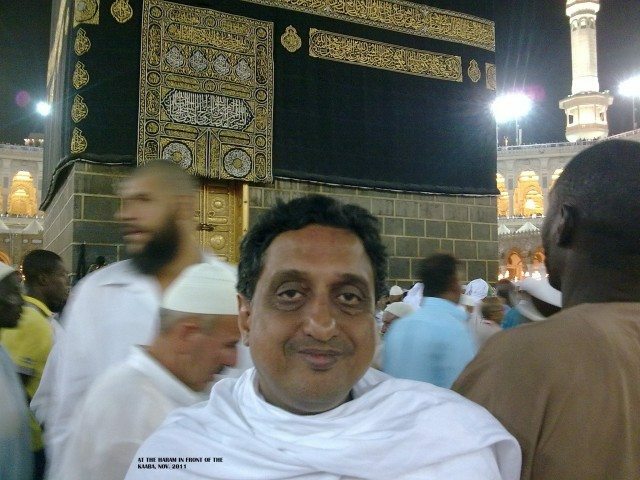 I am also a ghumakkar author and writing a post which includes some info on Mecca . If you have no problem , then whether I can use two – three pics from your post in my post.Please reply. Thank you for showing interest in my article. I would request you to first send me a draft of your article, and if there is no problem, I have no objection to your use of my photos as long as you acknowledge my name. However, first, you would have to send me the article on my off site email ID which is drtaher@gmail.com. Thanks for sharing this photos. Thanks for visiting my post and for the encouraging comments. After a good night’s sleep, we got up early and had breakfast at the hotel restaurant. Although, the quality of the food was good the service was very poor because of lack of staff at the restaurant. Then we waited at the lobby for the van(arranged by the hotel) to take us to the trip to Berijam lake,21 kms from Kodaikanal town and the tourist spots on the way.